a hereditary disorder involving marked reduction in the number of myelin sheaths of the globus pallidus and substantia nigra, with accumulations of iron pigment, progressive rigidity beginning in the legs, choreoathetoid movements, dysarthria, and progressive mental deterioration. 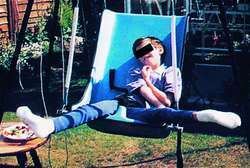 a disorder characterized by dystonia with other extrapyramidal dysfunctions appearing in the first two decades of life; associated with large amounts of iron in the globus pallidus and substantia nigra. a progressive degenerative neurological disease of children, with symptoms of parkinsonism. It is characterized by rigidity, athetosis, and dementia. The cause is an accumulation of iron pigments in the globus pallidus and substantia nigra. Treatment is similar to that of Parkinson's disease and Huntington's chorea. A slowly progressive condition which is now grouped with the so-called neurodegeneration with brain iron accumulation syndromes and characterised by progressive degeneration of neural function with loss of ambulation up to 15 years after disease onset. Mutation of PANK2 on chromosome 20p13, which encodes a protein belonging to the pantotheate kinase family, which catalyses the 1st step in the biosynthetic pathway leading to CoA production. Hallervorden-Spatz disease Neurology An AR condition first seen in childhood or adolescence Clinical Progressive neurologic degeneration with defects in muscle tone–rigidity, choreoathetosis, torsion spasm–dystonia, parkinsonism, cerebellar ataxia, speech impairment, mental deterioration, generalized rigidity Imaging Cerebral atrophy by CT DiffDx Dementia with extrapyramidal motor defects, Wilson's disease Management None Prognosis Poor; death within 10 yrs of onset. Hugo, German neurologist and psychiatrist, 1888-1969. Disorder characterized by dystonia with other extrapyramidal dysfunctions appearing in the first two decades of life.